It’s been a hard road to the top of the APEX charts for Coolmore’s Galileo, the consensus world number one. It’s one thing to be the top sire in North America and Europe by progeny earnings on the TDN General Sire List three straight years (2012-2014), while siring 60-some black-type horses a year, but it’s quite another to also be the top sire by indexes calculated using numbers of runners. The APEX A Runner Index is calculated using the percentage of a sire’s runners which achieve certain earnings thresholds, so for sires which have the highest number of runners, it’s more difficult to sustain high percentages no matter how many good horses they have. At the end of 2013, for example, after nearly a decade-long reign by A.P. Indy as the top North American or European sire by A Runner Index, it was Claiborne’s War Front, with fewer than a quarter of the number of year-starters as Galileo, who displaced A.P. Indy as the leading sire of 2013 by APEX A Runner Index. A Runner Index. War Front isn’t far behind, with a 4.02 A Runner Index (8.04% of year-starters). Galileo’s 149 A Runners 2008-2014 does put him in a league of his own in that regard; Giant’s Causeway is second by number of 2008-2014 A Runners, with 114. Rounding out the top five in that category are Juddmonte’s Dansili (90), WinStar’s Speightstown (89), and Lane’s End’s Smart Strike (89). With his last crop of 3-year-olds in 2014, Lane’s End’s A.P. Indy (3.68), in third by 2008-2014 A Runner Index, makes his final appearance as an APEX sire. Speightstown (3.49) ranks fourth, while in fifth is one of three ’slots states’ sires in the top 20, the retired New Mexico sire Desert God (3.38), a son of Fappiano himself. These calculations are earnings-based, so state/provincial jurisdictions with successful slots programs do routinely find their way on these lists. The other two ’slots state’ (or, to be accurate, ’slots province’) sires stood in Ontario: Niigon(3.15, ranks equal ninth), a son of Unbridled who unfortunately died young in 2012; and Philanthropist (3.04, equal 12th), who now stands at South Africa’s Drakenstein Stud, alongside Trippi and Duke of Marmalade. Keeping in mind the A Runner Index measures the frequency with which a sire gets runners which rank in the top 2% of earners, some more familiar names constitute the balance of the A Runner Index Top 20: in addition to Galileo, Europe supplies or supplied Monsun (3.26, dead); Dansili (3.15); Darley’s Dubawi (3.04); and Montjeu (3.02, dead). Unusual Heat (3.20, ranks 8th) is still the king of California. The remaining 11 are Kentucky sires: besides War Front, A.P. Indy, and Speightstown (ranked 2-3-4), these include: Adena Springs’ Ghostzapper (3.35); Darley’s Medaglia d’Oro (3.12) and Bernardini (2.75); Three Chimneys’ Dynaformer (2.89, dead); Giant’s Causeway (2.72); Ramsey Farm’s Kitten’s Joy (2.71); Hill ’n’ Dale’s Midnight Lute (2.69); and Gainseway’s record-breaking 2014 leading sire Tapit (2.68). True, by the way: this list includes most of the leaders by progeny earnings, but does not mirror it. That’s the objective. 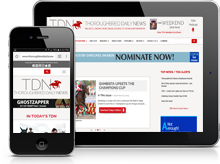 More next week (Thursday, Jan. 15), but in the meantime we’ll let you know when all the numbers are up on the TDN website. Bill Oppenheim may be contacted at [email protected] (please cc TDN management at [email protected]). Follow him on Twitter at www.twitter.com/billoppenheim.